Louis Anselm Lauriat, (c. 1786 – c. 1857), was a Boston aeronaut who reportedly made 48 balloon ascensions during his lifetime. He was born in Marseilles, France, and came to America in the early 1800s, where he settled in Boston and established a business at the corner of Washington and Springfield Streets in Boston producing gold leaf. He also developed an interest in science and balloons, and began making ascensions of his own. The following article appeared in the Vermont Phoenix on June 28, 1839, referring to an ill fated balloon ascension made by Lauriat on June 17, 1839. The article had first appeared in the Boston Transcript. The wind was West North West, with a strong breeze, when Mr. Lauriat ascended in his balloon from Chelsea yesterday afternoon; and as he rose from the garden of the Chelsea House, where the balloon was inflated, he was driven by the force of the wind against branches of a tree, and five of the cords by which the cars were attached to the aerostat were severed, and Mr. Lauriat was in imminent danger of being thrown out, – the balloon, however, was wafted on, at a low elevation, towards Shirley Point, where Mr. L endeavored to effect a landing, and letting off a portion of the gas, descended to the ground. The balloon was dragged some distance and came in contact with another tree, by which two more cords were severed, and left it retained only by a part of the netting. 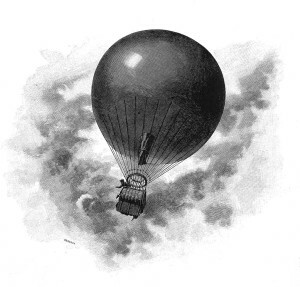 There was no assistance at hand, and the balloon, after being disengaged from the tree, was dragged, in despite of all Mr. L’s efforts to stop its progress, into the water, and continued skipping over the surface, sometimes completely immersing the aeronaut in the water, and again elevating him a hundred (feet) in the air. There were several vessels in the bay which endeavored to assist him, but were unable to reach him. The balloon was driven some eight or ten miles from land, and Mr. L became faint, discouraged at the moment by anticipation of a watery grave. In this perilous condition he continued until Capt. Paine of the schooner Fame, which was coming up the bay, discovered his situation, and launched a boat, which was rowed to his assistance, and happily, the progress of the balloon was intercepted, and the aeronaut rescued, just as the balloon rolled from the netting, and soared “free and unconfined,” away, and was soon lost to view. Mr. Lauriat was kindly received on board the schooner and carried to Gloucester, where he arrived about 9 o’clock. As he was very anxious to return home immediately, Mr. Mason, of the Stage House, generously conveyed him to Lynn, where he arrived at 1 o’clock this morning, pretty well satisfied, we hope, that ballooning is not the best mode of making gold leaf. Another source (see below) lists the captain of the schooner as being a Captain John Pierce, not Paine, of Welfleet, Massachusetts. Lauriat was reportedly dragged through the sea for one hour and fifteen minutes over a distance of thirty miles in the direction of Cape Ann, Massachusetts, which is located north of Boston. The balloon was not recovered, and was said to have cost $1,000, which was a huge sum of money in 1839. On June 17th, 1840, Lauriat made his 34th balloon ascension from Boston, and was in the air for nearly two hours. Lauriat’s – 1872 to 1922, “Being a Sketch of Early Boston Booksellers With Some Account of Charles E. Lauriat Company and its Founder, Charles E. Lauriat.”, Written for the Boston Evening Transcript by George H. Sargent, 1922.